2018 came as a shock for Momoiro Clover Z fans when green member Momoka Ariyasu suddenly announced her graduation from the group after a concert. Despite the somber news, the girls recently announced their 18th single Xiao Yi Xiao. The song will serve as the theme song for the upcoming 26th Crayon Shin Chan movie Crayon Shin-chan: Burst Serving! Kung Fu Boys ~Ramen Rebellion~. Besides the main title track two b-sides will be included on the single. The CD only, or Shin Chan version will feature it’s own exclusive b-sides. The CD+blu-ray (Momo Clo Edition) will include the full MV and offshot, stickers are first press bonuses for both editions. Additionally, the girls will be releasing a 10th anniversary BEST album on May 23rd. A CD only, 2CD+Blu-ray, and deluxe 3CD + 2Blu-ray have been announced so far. Crayon Shin-chan: Burst Serving! Kung Fu Boys ~Ramen Rebellion~ follows Shin-chan as he participates in a kung-fu challenge held in Kasukabe city’s Chinatown, which is known as Aiya Town. 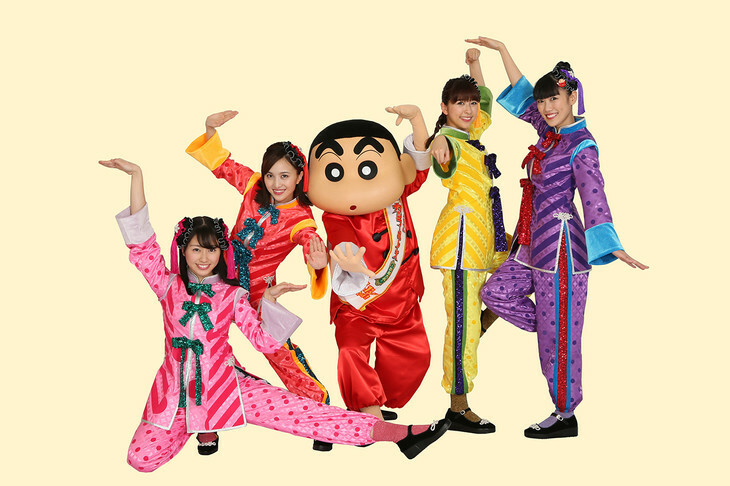 Shin-chan and his friends, the Kasukabe Defense Force, then decide to put on a no-stunt kung fu challenge on stage. Momorio Clover Z will appear in the film as the fictional idol group Kurokuro Clover Z. The film will be released to Japanese theaters on April 13th, 2018. Xiao Yi Xiao will come out on April 11th, 2018.